Dmitri Dmitrievich Shostakovich (Russian language: Дмитрий Дмитриевич Шостакович, Dmitrij Dmitrievič Šostakovič) (September 25, 1906 – August 9, 1975) was a Russian composer of the Soviet Union period. He had a complex relationship with the Soviet government, suffering two official denunciations of his music in 1936 and 1948 and the periodic banning of his work. At the same time, he remained the most popular Soviet composer of his generation and received a number of accolades and state awards, and served in the Supreme Soviet. "Amid the conflicting pressures of official requirements, the mass suffering of his fellow countrymen, and his personal ideals of humanitarian and public service, he succeeded in forging a musical language of colossal emotional power." Of course, Dmitri Shotakovich was not the only Russian artist to suffer under Communist repression, but his considerable success and his immense talent testify to the power of the human spirit and the spirit of creativity that cannot be denied by even the most godless regimes. He considered many of his symphonies to be "tombstones" for the countless victims who succumbed to the tyranny of Marxism in Russia. "I am willing to write a composition for each of the victims, but that is impossible, and that is why I dedicate my music to all of them." Birthplace of Shostakovich (now School no. 267). Commemorative plaque at left. Born at 2 Podolskaya Ulitsa in Saint Petersburg, Russia, Dmitri Shostakovich was the second of three children born to Dmitri Boleslavovich Shostakovich and Sofiya Vasilievna Shostakovich. His family was politically liberal (one of his uncles was a Bolshevik, but the family also sheltered far-right extremists). He was a child prodigy as both a pianist and composer, his talent becoming apparent after he began piano lessons at the age of nine. In 1918, he wrote a funeral march in memory of two leaders of the Constitutional Democratic party or Kadet party, murdered by Bolshevik sailors. In 1919, he was allowed to enter the Saint Petersburg or Petrograd Conservatory, then headed by Alexander Glazunov. However, he suffered for his perceived lack of political zeal, and initially failed his exam in Marxist methodology in 1926. His first major musical achievement was the Symphony No. 1, (premiered in 1926), written as his graduation piece. After graduation, he initially embarked on a dual career as a concert pianist and composer, but his dry style of playing (Fay comments on his "emotional restraint" and "riveting rhythmic drive") was often unappreciated. He nevertheless won an "honorable mention" at the 1927 Warsaw International Piano Competition. After the competition Shostakovich met the conductor Bruno Walter, who was so impressed by the composer's Symphony No. 1 that he conducted the Berlin premiere later that year. Thereafter Shostakovich concentrated on composition and soon limited performances primarily to those of his own works. In 1927, he wrote his Symphony No. 2, (subtitled To October). While writing the symphony, he also began his satirical opera The Nose, based on the story by Nikolai Gogol. In 1929, the opera was criticized as "Russian formalism" by RAPM, the Stalinist musicians' organisation, and it opened to generally poor reviews in 1930. The year 1927 also marked the beginning of the composer's relationship with Ivan Sollertinsky, who remained his closest friend until the latter's death in 1944. Sollertinsky introduced Shostakovich to the music of Gustav Mahler, which had a strong influence on his music from the Symphony No. 4 onwards. The year 1932 saw his open marriage to his first wife, Nina Varzar. Initial difficulties led to divorce proceedings in 1935, but the couple soon reunited. In 1936, Shostakovich fell from grace. The year began with a series of attacks on him in Pravda, in particular an article entitled Muddle Instead of Music. The campaign was instigated by Stalin and condemned Lady Macbeth as formalist. Consequently, commissions began to dry up, and his income fell by about three quarters. The Symphony No. 4 entered rehearsals, but the political climate made performance impossible. It was not performed until 1961, but Shostakovich did not repudiate the work. It retained its designation as his fourth symphony. A piano reduction was published in 1946. More widely, 1936 marked the beginning of the Great Terror, in which many of the composer's friends and relatives were imprisoned or killed. His only consolation in this period was the birth of his daughter Galina in 1936; his son Maxim Shostakovich was born two years later. The composer's response to his denunciation was the Symphony No. 5 of 1937, which was musically more conservative than his earlier works, and lacked overtly political content. It was a success, and is still one of his most popular works. It was also at this time that Shostakovich composed the first of his string quartets. His chamber works allowed him to experiment and express ideas which would have been unacceptable in his more public symphonic pieces. In September 1937, he began to teach composition at the Conservatory, which provided some financial security but interfered with his own creative work. 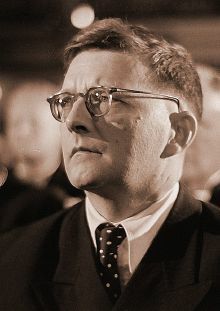 On the outbreak of the war between Russia and Germany in 1941, Shostakovich initially remained in Leningrad during the Siege of Leningrad, when he wrote the first three movements of his Symphony No. 7 (nicknamed Leningrad). He also contributed to propaganda efforts, posing as a fire warden and delivering a radio broadcast to the Soviet people. In October 1941, the composer and his family were evacuated to Kuybishev (now Samara, Russia), where the symphony was completed. It was adopted as a symbol of Russian resistance both in the USSR and in the West. In spring 1943, the family moved to Moscow. Whilst the Seventh Symphony depicts a heroic (and ultimately victorious) struggle against adversity, the Symphony No. 8 of that year is perhaps the ultimate in sombre and violent expression within Shostakovich's output, resulting in it being banned until 1960. The Symphony No. 9 (1945), in contrast, is an ironic Haydnesque parody, which failed to satisfy demands for a "hymn of victory". Shostakovich continued to compose chamber music, notably his Piano Trio No. 2 (Op. 67), dedicated to the memory of Sollertinsky, with a bitter-sweet, Jewish themed totentanz finale. In 1948, Shostakovich, along with many other composers, was again denounced for formalism in the Zhdanov Doctrine. Most of his works were banned, he was forced publicly to repent, and his family had privileges withdrawn. Yuri Lyubimov says that at this time "he waited for his arrest at night out on the landing by the lift, so that at least his family wouldn't be disturbed". In the next few years, his compositions were divided into film music to pay the rent, official works aimed at securing official rehabilitation, and serious works "for the desk drawer". These latter included the Violin Concerto No. 1 and the song cycle From Jewish Folk Poetry. There is some dispute over whether he realized the dangers of writing the latter. Laurel Fay has argued that he was attempting to conform with official policy by adopting folk songs as his inspiration. On the other hand it was written at a time when the post-war anti-Semitic campaign was already under way, and Shostakovich had close ties with some of those affected. The restrictions on Shostakovich's music and living arrangements were eased in 1949, in order to secure his participation in a delegation of Soviet notables to the U.S. That year he also wrote his cantata Song of the Forests, which praised Stalin as the "great gardener". In 1951, the composer was made a deputy to the Supreme Soviet. Stalin's death in 1953 was the biggest step towards Shostakovich's official rehabilitation, which was marked by his Symphony No. 10. It features a number of musical quotations and codes (notably the DSCH and Elmira motifs), the meaning of which is still debated, whilst the savage second movement is said to be a musical portrait of Stalin himself. It ranks alongside the Fifth as one of his most popular works. The year 1953 also saw a stream of premieres of the "desk drawer" works. During the forties and fifties, Shostakovich had close relationships with two of his pupils: Galina Ustvolskaya and Elmira Nazirova. He taught Ustvolskaya from 1937 to 1947. The nature of their relationship is far from clear: Mstislav Rostropovich described it as "tender" and Ustvolskaya claimed in a 1995 interview that she rejected a proposal from him in the fifties. However, in the same interview, Ustvolskaya's friend, Viktor Suslin, said that she had been "deeply disappointed" in him by the time of her graduation in 1947. The relationship with Nazirova seems to have been one-sided, expressed largely through his letters to her, and can be dated to around 1953 to 1956. In the background to all this remained Shostakovich's first, open marriage to Nina Varzar until her death in 1954. He married his second wife, Margarita Kainova, in 1956; the couple proved ill-matched, and divorced three years later. The year 1960 marked another turning point in Shostakovich's life: his joining of the Communist Party of the Soviet Union. This event has been interpreted variously as a show of commitment, a mark of cowardice, or as the result of political pressure. On the one hand, the apparat was undoubtedly less repressive than it had been prior to Stalin's death. On the other, his son recalled that the event reduced Shostakovich to tears, and he later told his wife Irina that he had been blackmailed. Lev Lebedinsky has said that the composer was suicidal. Around this time, his health also began to deteriorate. Shostakovich's musical response to these personal crises was the String Quartet No. 8, which like the Tenth Symphony incorporates quotations and his musical monogram. In 1962 he married for the third time, to Irina Supinskaya. In a letter to his friend Isaak Glikman, he wrote that, "her only defect is that she is 27 years old. In all other respects she is splendid: clever, cheerful, straightforward and very likeable". In November, Shostakovich made his only venture into conducting, directing a couple of his own works in Nizhny Novgorod (Gorky); otherwise he declined to conduct, giving nerves and ill-health as his reasons. That year saw Shostakovich again turn to the subject of anti-semitism in his Symphony No. 13 (subtitled Babi Yar). The symphony sets a number of poems by Yevgeny Yevtushenko, the first of which commemorates a massacre of the Jews during World War II. Opinions are divided as to how great a risk this was; the poem had been published in Soviet media, and was not banned, but it remained controversial. After the symphony's premiere, Yevtushenko was forced to add a stanza to his poem which said that Russians and Ukrainians had died alongside the Jews at Babi Yar. "Target achieved so far: 75% (right leg broken, left leg broken, right hand defective. All I need to do now is wreck the left hand and then 100% of my extremities will be out of order.)" A preoccupation with his own mortality permeates much of Shostakovich's later works, among them the later quartets and the Symphony No. 14 of 1969 (a song cycle based on a number of poems concerning the theme of death). The subject matter of this work also coincides with Shostakovich at his most extreme in terms of musical language, with twelve note themes being used throughout as well as dense polyphony. The Symphony No. 15 of 1971 is, by contrast, melodic and retrospective in nature, quoting from Wagner, Rossini and the composer's own Fourth Symphony. Shostakovich died of lung cancer on August 9, 1975 and after a civic funeral was interred in the Novodevichy Cemetery in Moscow, Russia. Even before his death he had been commemorated in the naming of the Shostakovich Peninsula on Alexander Island, Antarctica. He was survived by his third wife Irina, his daughter Galina, and his son Maxim Shostakovich, a pianist and conductor who was the dedicatee and first performer of some of his father's works. Shostakovich himself left behind several recordings of his own piano works, while other noted interpreters of his music include his friends, Emil Gilels, Mstislav Rostropovich, Tatiana Nikolayeva, and Maria Yudina. Shostakovich's musical influence on later composers outside the former Soviet Union has been relatively slight, although Alfred Schnittke has taken up his eclecticism, and his contrasts between the dynamic and the static, and some of André Previn's music shows clear links to Shostakovich's style of orchestration. His influence can also be seen in some Nordic composers, such as Kalevi Aho and Lars-Erik Larsson. Many of his Russian contemporaries, and his pupils at the St. Petersburg Conservatory, however, were strongly influenced by his style (including German Okunev, Boris Tishchenko, whose 5th Symphony of 1978 is dedicated to Shostakovich's memory, Sergei Slonimsky, and others). Shostakovich's conservative idiom has nonetheless grown increasingly popular with audiences both within and beyond Russia, as the avant-garde has declined in influence and debate about his political views has developed. According to Grove, he has now become "the most popular composer of serious art music of the middle years of the 20th century". Shostakovich's works are broadly tonal and in the Romantic tradition, but with elements of atonality and chromaticism. In some of his later works (e.g. the String Quartet No. 12), he made use of tone rows. His output is dominated by his cycles of symphonies and string quartets, fifteen of each. The symphonies are distributed fairly evenly throughout his career, while the quartets are concentrated towards the latter part. Among the most popular are the Symphony No. 5, the Symphony No. 10, the String Quartet No. 8 and String Quartet No. 15. Other works include the operas Lady Macbeth of the Mtsensk District, The Nose and the unfinished The Gamblers; six concertos (two each for the piano, violin and cello); and a large quantity of film music. Shostakovich's music shows the influence of many of the composers he most admired: Bach in his fugues and passacaglias; Beethoven in the late quartets; Mahler in the symphonies and Berg in his use of musical codes and quotations. Among Russian composers, he particularly admired Modest Mussorgsky, whose operas Boris Godunov and Khovanshchina he re-orchestrated; Mussorgsky's influence is most prominent in the wintry scenes of Lady Macbeth and the Eleventh Symphony, as well as in his satirical works such as "Rayok". Prokofiev's influence is most apparent in the earlier piano works, such as the first sonata and Piano Concerto No. 1. The influence of Russian church and folk music is very evident in his works for unaccompanied choir of the 1950s. Many commentators have noted the disjunction between the experimental works before the 1936 denunciation and the more conservative ones which followed. The composer told Flora Litvinova, "without 'Party guidance'... I would have displayed more brilliance, used more sarcasm, I could have revealed my ideas openly instead of having to resort to camouflage". Articles published by Shostakovich in 1934 and 1935 cited Berg, Schoenberg, Krenek, Hindemith, "and especially Stravinsky" among his influences. Key works of the earlier period are the Symphony No. 1, which combined the academicism of the conservatory with his progressive inclinations; The Nose ("The most uncompromisingly modernist of all his stage-works"; Lady Macbeth of the Mtsensk District, which precipitated the denunciation; and the Symphony No. 4, described by Grove as "a colossal synthesis of Shostakovich's musical development to date". The fourth symphony was also the first in which the influence of Mahler came to the fore, prefiguring the route Shostakovich was to take to secure his rehabilitation, while he himself admitted that the preceding two were his least successful. In the years after 1936, Shostakovich's symphonic works were outwardly musically conservative, regardless of any subversive political content. However, during this time he turned increasingly to chamber music works, "a field where he could compose with maximum seriousness and minimum external pressure". While these were also largely tonal, they did give Shostakovich an outlet for the darker content which was not welcomed in his more public works. This is most apparent in the late chamber works, which portray a "world of purgatorial numbness"; in some of these he included the use of tone rows, although he treated these as melodic themes rather than serialism. Vocal works are also a prominent feature of his late output, setting texts often concerned with love, death and art. One prominent criticism of Shostakovich has been that his symphonic work in particular is, in the words of Shostakovich scholar Gerard McBurney, "derivative, trashy, empty and second-hand." The view has been expressed both by western figures such as Pierre Boulez ("I think of Shostakovich as the second, or even third pressing of Mahler") and by Soviet figures such as Filip Gershkovich, who called Shostakovich, "a hack in a trance". A related complaint is that he is vulgar and strident: Stravinsky wrote of the opera Lady Macbeth of the Mtsensk District being, "brutally hammering... and monotonous", while the famous Pravda editorial Muddle Instead of Music said of the same work, "All is coarse, primitive and vulgar. The music quacks, grunts and growls." It is certainly true that Shostakovich borrows extensively from the material and styles both of earlier composers and of popular music; the vulgarity of "low" music is a notable influence on this "greatest of eclectics". McBurney traces this to the avant-garde artistic circles of the early Soviet period among which Shostakovich moved early in his career, and argues that these borrowings were a deliberate technique to allow him to create, "patterns of contrast, repetition, exaggeration" which gave his music the large-scale structure it required. Shostakovich was in many ways an obsessive man. According to his daughter he was "obsessed with cleanliness"; he synchronized the clocks in his apartment; he regularly sent cards to himself to test how well the postal service was working. Wilson's Shostakovich: A Life Remembered indexes 26 references to his nervousness. Even as a young man, Mikhail Druskin remembers that the composer was "fragile and nervously agile". Yuri Lyubimov comments, "The fact that he was more vulnerable and receptive than other people was no doubt an important feature of his genius". In later life, Krzysztof Meyer recalled, "his face was a bag of tics and grimaces". In his lighter moods, sport was one of his main recreations, although he preferred spectating or umpiring to participating (he was a qualified football (soccer) player and football referee). He also enjoyed playing card games, particularly Solitaire or Patience. Both light and dark sides of his character were evident in his fondness for satirical writers such as Nikolai Gogol, Chekhov and Mikhail Zoshchenko. The influence of the latter in particular is evident in his letters, which include wry parodies of Soviet officialese. Zoshchenko himself noted the contradictions in the composer's character: "he is ... frail, fragile, withdrawn, an infinitely direct, pure child... [but he is also] hard, acid, extremely intelligent, strong perhaps, despotic and not altogether good-natured (although cerebrally good-natured)". He was diffident by nature. Flora Litvinova has said he was "completely incapable of saying 'No' to anybody". This meant he was easily persuaded to sign official statements, including a denunciation of Andrei Sakharov in 1973; on the other hand he was willing to try to help constituents in his capacities as chairman of the Composers' Union and Deputy to the Supreme Soviet. Oleg Prokofiev commented that "he tried to help so many people that... less and less attention was paid to his pleas". Shostakovich's response to official criticism is disputed. It is clear that outwardly he conformed with the state, reading speeches and putting his name to articles expressing the government line. It is also generally agreed that he disliked the regime, a view confirmed by his family, his letters to Isaak Glikman, and the satirical cantata "Rayok," which ridiculed the "anti-formalist" campaign and was kept hidden until after his death. What is uncertain is the extent to which Shostakovich expressed his opposition to the state in his music. The revisionist view was put forth by Solomon Volkov in the 1979 book Testimony, which was claimed to be Shostakovich's memoirs dictated to Volkov. The book claimed that many of the composer's works contained coded anti-government messages. It is known that he incorporated many quotations and motifs in his work, most notably his signature DSCH theme. His longtime collaborator Yevgeny Mravinsky said that "Shostakovich very often explained his intentions with very specific images and connotations". The revisionist perspective has subsequently been supported by his children, Maxim and Galina, and many Russian musicians. More recently, Volkov has argued that Shostakovich adopted the role of the yurodivy or holy fool in his relations with the government. Shostakovich's widow Irina supports the general revisionist thesis but denies the authenticity of Testimony. Other prominent revisionists are Ian MacDonald, whose book The New Shostakovich put forward more interpretations of his music, and Elizabeth Wilson, whose Shostakovich: A Life Remembered provides testimony from many of the composer's acquaintances. Many musicians and scholars (notably Laurel Fay and Richard Taruskin) contest the authenticity (and debate the significance) of Testimony, alleging that Volkov compiled it from a combination of recycled articles, gossip, and possibly some information direct from the composer. More broadly, they argue that the significance of Shostakovich is in his music rather than his life, and that to seek political messages in the music detracts from, rather than enhances, its artistic value. ↑ Dmitrii Shostakovich, Shostakovich: About Himself and His Times, compiled by L. Grigoryev and Ya. Platek, trans. Angus and Neilian Roxburgh (Moscow: Progress Publishers, 1981), 33. ↑ Elizabeth Wilson, Shostakovich: A Life Remembered p. 183. ↑ Allan Ho and Dmitry Feofanov, Shostakovich Reconsidered p. 390. ↑ Manashir Yakubov, programme notes for the 1998 Shostakovich seasons at the Barbican Arts Centre, London). ↑ Dmitri Shostakovich and Isaak Glikman, Story of a Friendship: The Letters of Dmitry Shostakovich to Isaak Glikman p. 102. ↑ Musicweb International, Lars-Erik Larsson Retrieved July 25, 2016. ↑ Laurel Fay, Shostakovich: A Life pp. 119, 165, 224. ↑ Grove pp. 288, 290. ↑ 22.0 22.1 Gerard McBurney, Whose Shostakovich? Retrieved July 25, 2016. ↑ Haas, Shostakovich's Eighth: C minor Symphony against the Grain p. 125. ↑ Michael Ardov,Memories of Shostakovich p. 139. ↑ Quoted in Fay, p. 121. Fay, Laurel. "Dmitri Shostakovich", Grove Dictionary of Music and Musicians. Macmillan Publishers, 2001. Haas, David. "Shostakovich's Eighth:C minor Symphony against the Grain" Shostakovich in Context Bartlett (ed). MacDonald, Ian. Shostakovichiana Music Under Soviet Rule. Retrieved July 25, 2016. This page was last modified on 17 October 2017, at 21:51.